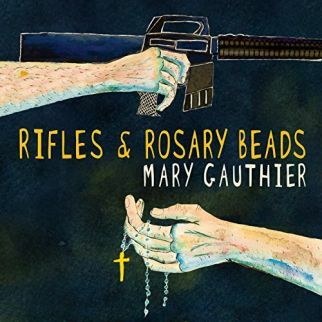 The recent release from Mary Gauthier, Rifles and Rosary Beads, is a sequel to war. The songs were co-written by Mary along with U.S. veterans and their families. The stories relate the experience of the military personnel while abroad and when they return home. 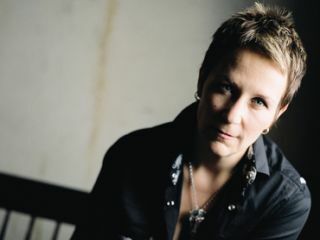 Mary Gauthier was paired with wounded veterans and active military through a non-profit program, Songwriting With Soldiers. Mary Gauthier has fought battles with her words and music throughout her previous releases, using the songs of Rifles and Rosary Beads to help veterans share their own experiences There is a nearly-physical power created when her knack for finding the way to tell a tale is paired with history from humans whose day-to-day lives are filled with intense situations and lasting memories. Questions rise up in the search for heavenly wings as “Still on the Ride” looks for angels while “Brothers” speaks directly to the demons corralled by long-manned borders of military service. Rifles and Rosary Beads puts flesh and bone, heart and soul into the characters as a Veterans Day parade makes its way through Nashville, Tennessee (“Bullet Holes in the Sky”) and an auto mechanic finds the enemy within friendly fire in “Iraq” as the stories are soundtracked with sad country strums (“The War After the War”), tender Folk (“It’s Her Love”), and a classic rock’n’roll one-note groove (“Got Your Six”). Mary Gauthier is a master storyteller, using her art to translate little heard first-hand tales from men and women with memories and current lives that few can imagine. Rifles and Rosary Beads quietly heals the horrors of war with whatever is available on the title track and balances the battle-learned lessons with a life at home with “Soldiering On” as Mary Gauthier takes flight with the passengers in “Morphine 1-2” and sits at the table with EOD (explosive ordinance disposal) wives helping returning warrior mates adjust to life at home in “Stronger Together”.